1002WEP Power Alarm - Blue Max Lighting & Emergency Equipment Ltd.
TOMAR’s model 1002WEP Explosion-Proof POWER ALARM® siren is a rain tight solid state audible alarm, that features a choice of 8 field selectable tones plus remote control selection of 4 tones with priority. 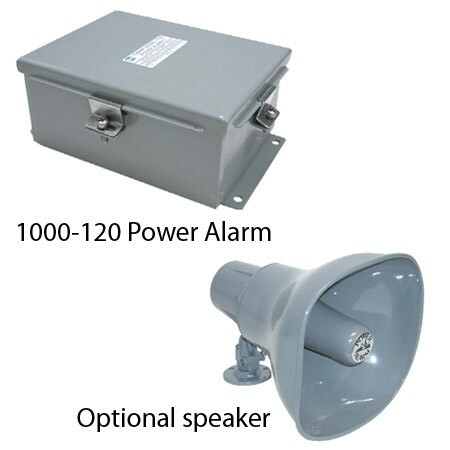 TOMAR’s model 1002WEP Explosion-Proof POWER ALARM® siren is a rain tight solid state audible alarm, that features a choice of 8 field selectable tones plus remote control selection of 4 tones with priority. All models of 1002WEP alarms are o-ring gasketed and are UL listed for Class I, Division 1, Group C & D, Class I, Division 2, Groups A, B, C, & D, Class II, Division 2, Groups F & G, NEMA Type 4X, and marine outside (salt water) use. Explosion proof sounder shall be Tomar model 1002 WEP or approved equal. The loudspeaker shall be UL Listed Class I, Division 1 and 2, Class II, Division 2, and Class III for use in specified hazardous locations and/or combustible atmospheres as classified by the National Electric Code. The explosion proof sounder shall have 9 integrated field selectable sounds plus remote control selection of 4 sounds with priority. Speaker housing must have O-ring gasket and be NEMA 4X and marine (salt water) rated. Projector horn shall be a reflex type with polycarbonate re-entrant section. Voice coils shall be field-replaceable, and the operating temperature rating is to be -55C to 85C; -67F to 185F. 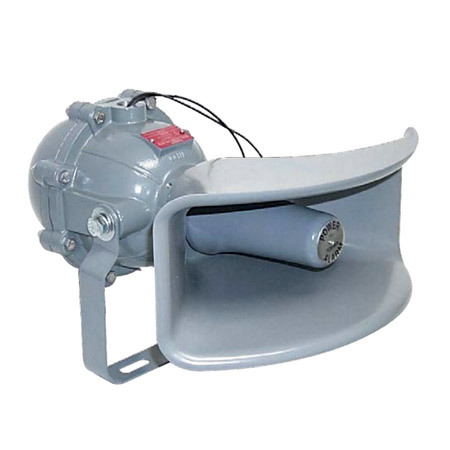 TOMAR’s POWER ALARM® SIREN is a heavy duty industrial audible alarm designed to operate under adverse industrial conditions such as shock, vibration, or transient voltage surges.